Hayao Miyazaki’s new film is indeed a feast for the eyes. Drawing from Diana Wynne Jones’ book of the same name, Howl’s Moving Castle takes us to a wonderful steampunk-ish world full of huge, ungainly machines that belch smoke into the clear blue sky. This sub-genre of fantasy has come a long way since Michael Moorcock’s ‘The Warlord of the Air’ or William Gibson and Bruce Sterling’s ‘The Difference Engine’, and has manifested on the big screen quite recently with films like Steamboy and The League of Extraordinary Gentlemen. It’s a pity that none of those features have been fantastic, and indeed Miyazaki’s film unfortunately falls short also. 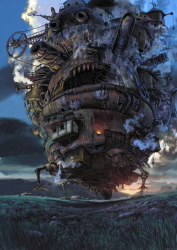 Like Spirited Away (Sen to Chihiro no Kamikakushi), Howl’s Moving Castle has a wondrous beginning. Not only does it feature a heroine who works by day as a milliner (an underrepresented field in feature film narrative), but the world is fleshed out beautifully with stunning settings and marvellously comic creations. Turniphead has to be one of the best scarecrow characters of recent years (he’s much cleverer than the one that had no brain), and the film makes some clever observations about ageing and the elderly. Unfortunately Howl himself is kind of disappointing – a bit of a whining ponce, really. Plus there’s the fact that (like most anime creations) he seems to be stuck in the late 80s/early 90s, with his super high pants (Mark would like them), billowing shirt and sparkling eyes. The film falls apart towards the end as we sluggishly work our way through the last half hour. Again, like Spirited Away, I simply didn’t care by the time the last act came around – I just wanted it to be over. There are some pathetic ten second resolutions in the last few moments that downright insult the first half of the film. On a macro level, there is a general anti-war theme, although the background story surrounding the ongoing war is pretty hazy at best. This entry was posted in Film Reviews and tagged Anime, Foreign Language, Steampunk by Stuart Wilson. Bookmark the permalink.